International tourist arrivals recorded the highest increase in seven years since 2010, some 84 million more than in 2016, reaching 1.3bn last year, up by 6.8% y/y and well above UN’s World Tourism Organization long-term forecast of 3.8% per year for the 2010-2020 period. Sustained travel demand for destinations across all world regions was evident in 2017 with the strong recovery of outbound demand from Brazil and Russia after few years of decline and the ongoing rise of India, also contributing to inbound growth in many destinations. By region, Africa and Europe grew above average at 8.7% and 8.2% y/y growth, respectively. By sub-region, North Africa and Southern and Mediterranean Europe led results in 2017, reflecting firm demand for Mediterranean destinations. Similarly, real international tourism receipts or in better words, receipts adjusted for exchange rate fluctuations and inflation reached 1.34tr in 2017, up by 4.9% y/y. In addition to tourism receipts, international tourism generated an additional USD 240bn billion from international passenger transport services rendered. So with a total of roughly USD 1.6tr tourism is the world’s 3rd largest export category after chemicals and fuels, averaging USD 4bn per day. Source: Tratok Ltd, Bloomberg, World Tourism Organisation (UNWTO). 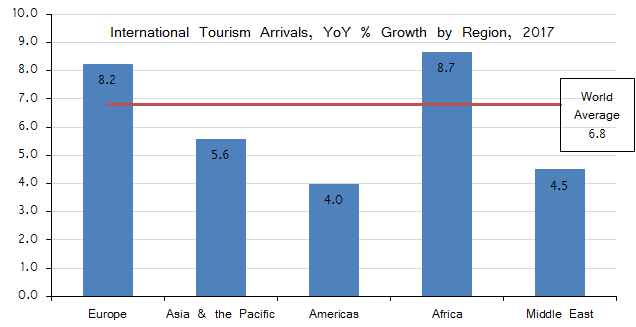 Source: World Tourism Organisation (UNWTO).